Notice: This product has been phased out and is no longer available. 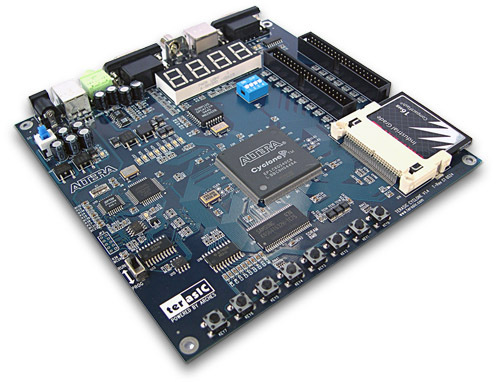 The Altera DE1 board is the recommended replacement. The TREX C1 Development Kit provides a complete, high-quality, multimedia platform featuring Altera Cyclone (EP1C6Q248C8) FPGA device. With the built-in USB blaster circuits , the TR1 development board has many multimedia features for users to develop advanced video, audio, memory and storage applications using the most popular components in consumer electronic products such as DVD and VCD players. The TR1 Development Kit also includes a C++ program and controller IPs for peripheral controls to allow users to build up advanced applications in shortest timeframe. Users can use either the USB blaster link or RS-232 link to control the board.